You look cute, but not happee...guess it's a little early for you, huh? Snuggly AND fashionable! Good job Lily. Happy August 1st, my friends! You look GREAT! Lily says - get this hat off of me! I want to get into my pool!! What a great hat..... You look very gorgeous. It's only happy cause I get to see your pretty face Lil! Ohhhh my goodness!!!! Sooo cute! You look happy, Lily. Happee Monday! A very Happy Monday and Happy August to you too Lil and Benny! Lily, who is your milliner? That hat is absolutely fantastic! Your hat looks happy, but your face doesn't quite have the same vibe. Just beautiful, Lily - Happy Monday to you too. I really like all of your hats! 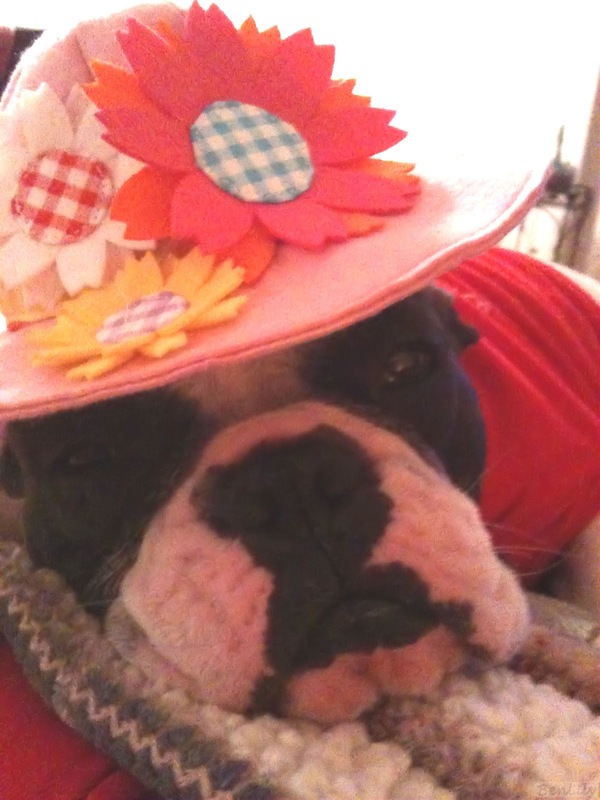 You look so adorable in your daisy hat, Lily! Flowers on your head definitely become you, Lily!!! Hey, you've got a new look and a new name since I last visited! I like it, very hip. That header photo is awesome! Pretty hat. I hope it keeps the sun out of your eyes! you look so adorable and fluffy in your fluffy hat! Happy Monday and Happy August to you and Benny! OMG now THIS made me smile! lol. Happy Monday to you too! Are you really happy....or just trying to get into the mood. Oh my, Dont you look just super Snazzi there Lily!! very beautiful!! Lily, you sure are making Stevie Wonder jealous with that beautiful hat. She has been buggin me for one all morning! Oh Lily, what a fabulous start to the week!